That tactical shift towards at least some of the demands of the miners won for the Republican Roosevelt major blue-collar support from ordinary working Americans whose vote was becoming increasingly significant. The rights and interests of the laboring man will be protected and cared for, not by the labor agitators, but by the Christian men to whom God in His infinite wisdom has given control of the property interests of the country. As the vast British Empire went into a prolonged and seemingly irreversible decline following a major economic Depression beginning in 1873, a challenge began to emerge from across the Atlantic. Powerful American industrial and banking families grouped around J.P. Morgan and John D. Rockefeller concentrated the wealth and control of American industry into their own hands. In their rise to unprecedented heights of power, the Morgan and Rockefeller interests deployed fraud, deceit, violence, and bribery -- and they deliberately manipulated financial panics. Each financial panic, brought about through their calculated control of financial markets and banking credit, allowed them and their closest allies to consolidate ever more power into fewer and fewer hands. It was this concentration of financial power within an elite few wealthy families that created an American plutocracy or, more accurately, an American oligarchy. Aristotle used the term “oligarchy” to describe rule by the wealthiest families, where voting power in the state was related to the size of a family’s fortune. Whether it was called an oligarchy or a plutocracy—government by a wealthy “class”—the real power in the spectacular rise of the American Century at the end of the 1890s did not rest democratically in the hands of the majority of citizens. It did not even lie in the hands of a broad, educated and growing middle class. Power, together with control over the nation’s economy, was being ruthlessly centralized in the hands of the wealthy few, every bit as much as it had been in the days of Imperial Rome. The more centralized that power became in the hands of an aristocracy of wealth, the more it wrapped itself in the rhetorical garb of American “democracy.” In one respect, and one respect only, the new American oligarchy was democratic: it did not restrict entry to those of noble birth and bloodline, as had been the case with the decadent nobility of ancient Rome or pre-revolutionary France. The American Constitution prohibited inherited titles of nobility and aristocracy. It did not, however, prohibit an aristocracy of wealth—either inherited or created. Like Britain around the time of the founding of the private Bank of England in 1694, this “open admissions” aristocracy would turn out to be a key factor in the dynamism of the emerging American empire—the “American Century” as Henry Luce was later to name it. In the closing decades of the 19th Century, anyone clever, determined and ruthless enough to win the Darwinian survival of the fittest award by amassing a huge fortune -- and holding onto it -- was eligible for membership, almost regardless of class, religion or national origin. Race, however, remained a barrier to entry to the higher circles of power in America for at least another century. This oligarchy used its immense economic power, often secretly and in coordinated fashion, to orchestrate events that generated waves of bankruptcies and severe economic depressions, even panics. The emerging American oligarchy cynically corrupted and co-opted state legislatures, governors, US Congressmen, judges, newspaper editors and even Presidents to serve their private interests. Those interests were served by wars their captive press helped trigger, wars from which that oligarchy profited while thousands of young Americans perished for causes they knew nothing about. The prevalent myth claimed that a rugged American frontier inspired the democratic and entrepreneurial spirit of the United States in the remarkable industrial expansion after the Civil War. In reality, by the late 1870s, after the enactment of the Specie Resumption Act of 1875 which fully took effect in the year 1879 -- and which, in effect, put the United States on the London Gold Standard -- few countries had financial and economic power so concentrated in so few hands as did the United States. By the 1880s two colossal groups had emerged within the United States’ wealthiest families. Initially they were bitter, hated rivals. In the end they became allies, not out of love but out of practicality, in one of the greatest concentrations of financial and industrial power ever seen. The two families, Rockefeller and Morgan, created a combination of wealth and control so powerful in its influence over the economic and financial life of the United States at the beginning of the 20th Century that Congressional critics named it the Money Trust. The emergence of the Morgan group as the decisive money power in the United States required years of covert and usually corrupt machinations. The Panic of 1893 led to a severe US economic depression that lasted four years. It exemplified the lengths to which the emerging Money Trust around J.P. Morgan was willing to go to amass concentrated power. Following the American Civil War, right up to the end of the 19th Century, the United States Treasury recognized silver as well as gold as monetary metal. The monetary system was, in effect, a bi-metallic system. Silver existed in abundance in the Western United States. Farmers and small shop owners advocated using silver to expand cheap credit to allow the economy to grow. It made sense if expansion of the monetary base through the Federal Government were carefully guided. However, the influential New York bank syndicate, headed in the 1890s by the House of Morgan, took the opposite position. They saw gold, especially in light of their close ties to leading London banks, as their best road to dominant power over the money supply of the United States. Supplies of monetary gold were controlled by a handful of New York banks and by the financial powers of the City of London -- above all, by the banking group of Lord Rothschild. The New York bankers wanted no competition from silver. Their banking allies in the City of London, the heart of the world gold standard at the time, wanted America exclusively on a gold standard where their influence would be vastly greater. London’s New York banking allies -- J.P. Morgan, along with Rothschild’s US banking agent, August Belmont, and others in New York finance -- shrewdly used their London banking associates to control American credit markets to their own exclusive advantage and to the distinct disadvantage of the general American public. It was no easy challenge, but they were single-minded in their determination regarding the gold standard. The infamous Panic of 1893 was in fact manipulated by Morgan interests, in collusion with August Belmont, in order to end the role of silver and to consolidate the gold of the nation into the hands of the private New York banks. In the course of manipulating several financial panics, the same bankers also gained unprecedented control over the nation’s steel and railroads—the heart of the economy. The point man for Morgan and company was John G. Carlisle, Secretary of the Treasury under Democratic President Grover Cleveland. Cleveland, a mediocre New York City politician before getting the financial backing of Morgan and friends to become President, was on intimate terms as President with two frequent private White House guests. The two were J.P. Morgan and August P. Belmont, Jr., son of (London) Rothschild’s official banking agent in the United States. August P. Belmont, Sr. had been rumored in London society circles to be the illegitimate son of Baron Karl Meyer Rothschild, who, in any case had adopted the young Belmont as if he were his son, dispatching him to manage the Rothschilds’ American business interests under the less-controversial Belmont name. The one hand washes the other…. Morgan’s takeover of America’s gold reserves began in 1893. Following Cleveland’s second inauguration as President in early 1893, Morgan and Belmont secretly instigated a run on the US Treasury’s gold reserves. Colluding London banks, acting via instructions from Morgan and Belmont, right on cue, sold the millions of US Treasury securities they held, and demanded payment in gold. At the time, the Treasury by law was allowed to pay for redeemed bonds in either gold or silver. The powerful silver lobby naturally urged that the Treasury pay in silver not gold. Under the law, the decision was left to the Treasury Secretary’s discretion. But Secretary Carlisle was getting his advice secretly from Morgan and Belmont. As a result Carlisle refused to redeem the bonds for silver, which would have ended the gold hoarding panic. Instead, he redeemed the securities exclusively in gold, feeding further panic as US Government gold stocks disappeared rapidly. The consequence was that the US Treasury’s gold reserves vanished. By April 1893 the reserves of gold fell below $100 million for the first time since resumption of specie payments in 1879. The trap had been masterfully set. J.P. Morgan and August Belmont, Jr. had convinced Cleveland to have his Treasury Secretary, John Carlisle, issue US Treasury bonds exclusively to Morgan and Belmont. In exchange, the private bankers paid the Treasury with gold that was urgently needed for the Government’s foreign reserves. The prevailing practice was to maintain US Treasury minimum gold reserves of $100 million; anything below that being grounds for alarm over the stability of the dollar. Cleveland’s Treasury Department sold the bonds to the private Morgan banking syndicate at a steep discount. The bankers in turn immediately resold the bonds at much higher prices to the investing public—small regional banks, insurance companies and others—pocketing the huge profit from what amounted to an insider trade. To complete the circle of corruption, President Cleveland’s former law partner F. L. Stetson represented J.P. Morgan & Co. for whom he negotiated the terms of the bond issues with the US Treasury. To call this arrangement a conflict of interest and violation of the public trust would be mild. Cleveland managed to sell a staggering $162,000,000 of such bonds to the Morgan private syndicate at sweetheart prices before the anti-corruption World, the newspaper of journalist Joseph Pulitzer, exposed the deals forcing an end to the highly profitable operation. By May 1893, full-scale panic had broken out across the United States. Some weeks later the government of India, then a British colony, announced that it would no longer accept silver to mint for coin. India, largely as a result of the earlier machinations of the British Opium Wars against China, had become the world’s largest holder of silver bullion. The Indian colony’s rejection of silver gave an added boost to the London-New York bankers’ plot to destroy once and for all the monetary role of silver in America. It led to a catastrophic 50% fall in the international price of silver, including in the United States. There was more than a little suspicion within US circles hit by the money panic that certain banking houses of the City of London and New York which stood to gain handsomely from the gold panic had encouraged the Indian government, the crown jewel of Her Majesty’s British Empire, to reject silver purchases. In early 1895, the US Treasury had again been emptied of its gold, which it had just purchased at usurious rates from J.P. Morgan & Co.’s banking syndicate. Where had the gold gone? Records of private gold holdings of the New York banks show that in January 1895 twenty six New York banks held in their vaults a hoard of $65 million of gold. US Treasury reserve minimum for gold at the time was $100 million. To fall below that level, as noted, was considered dangerous for US financial stability. President Cleveland reportedly cried, “the banks have got the country by the throat.” He was careful not to reveal to the ignorant citizenry his help in giving the banks the rope. At the critical moment, a syndicate appeared with a “generous” proposal. Led by J.P. Morgan & Company, August Belmont & Company representing the London Rothschilds, and James Speyer of Rockefeller’s National City Bank, the syndicate offered to sell their private gold to the US Treasury—for a handsome profit of course. The gold hoarding Panic of 1893 resulted in a contraction of bank credit across America that triggered the worst economic depression in US history up to that time. By law, holders of US paper currency could redeem in gold from the US Treasury. As a result of the panic, most banks feared to lend. Between May and October 1893, national bank loans contracted by an alarming $318 million. Rates on bank money hit 70% as banks and private individuals frantically sought gold. Exports of gold from the United States to the City of London were the heaviest in US history as London banks demanded gold as security for their US loans. The gold panic severely cut into US Government tax revenues, increasing the deficit, and forcing the Treasury to use its increasingly scarce gold reserves to pay current expenses, further impacting gold reserves. The credit crisis led to a wave of business failures and bankruptcies across America from East to West as banks called in their loans. Western farmers and silver miners blamed Eastern gold banks whom they believed secretly sought to discredit silver. They were right. On cue, in August 1893 President Cleveland, advised by Morgan and Belmont, called a Special Session of Congress to repeal the Sherman Silver Act, under which the US Treasury had bought silver in exchange for US Treasury notes that in turn could be exchanged for gold by their bearers. The Sherman Silver Act had originally been passed under pressure from farmers and small businesses that faced depression and ruin as a result of the forced shift to an exclusively gold-backed dollar. Cleveland successfully argued that by ending the Government’s silver purchase, the nation would avert financial disaster. Predictably, the opposite proved to be the case as silver, which was in abundance, was no longer a practical alternative to gold. The victory of J.P. Morgan, Belmont and their Wall Street cronies was formalized into law. A Monetary Commission was set up in January 1897. The Gold Standard Act, introduced into the House of Representatives in December 1899, was passed by Congress and became law in March 1900. The Act confirmed the gold dollar as the standard of value, with silver as only a subsidiary coinage. President Cleveland arranged for Morgan to create a private syndicate on Wall Street to supply the US Treasury with $65 million in gold, half of it from Europe, to float a bond issue that restored the treasury surplus of $100 million. The Treasury bonds were sold at rock-bottom sweetheart prices exclusively to the Morgan-Belmont syndicate, not to the general public. Morgan then resold the bonds at hefty premium to smaller regional banks and insurance companies, making a handsome profit at both ends of the deal at the expense of the economic health of the nation. During the ensuing Great Depression of 1893, lasting for four full years, spending for capital goods collapsed, profits plunged, and depression hit the cities en masse. Over the course of this depression 15,000 businesses, 600 banks, and 74 railroads failed. There was severe unemployment and wide-scale protesting, which in some cases turned violent. At the peak of the ensuing unemployment, an unprecedented 14.5% of the active labor force was out of work. Some estimates put the jobless figure as high as 25%. The deliberately engineered economic collapse of the Philadelphia and Reading Railroads had been the first step in the oligarchy’s consolidation of railroad ownership. J.P. Morgan had organized a credit boycott of the railroad, triggering a sharp fall in the rail’s stock, at which point Morgan quietly bought controlling shares at dirt-cheap prices. The rail was linked to vast anthracite coal deposits in Pennsylvania. Meanwhile, in the midst of the gold panic, by May 15, 1893 stock prices in the New York Stock Exchange reached an all-time low. This included major railroads, many of which -- such as the Union-Pacific, Northern-Pacific and Santa Fe railroads -- were forced to declare bankruptcy. The chain of major railroad bankruptcies across America provided the “golden opportunity” for the highly solvent banks of the Morgan-Belmont syndicate to consolidate their iron grip over the expanding US railway network, at that time the heart of the American economic expansion. America’s business tycoons emerged in the economic boom years following the Civil War of 1861-65 and the Specie Resumption Act of 1875, accumulating and consolidating vast fortunes largely through fraud, bribery of public officials and Congress, corruption, forced bankruptcies and other noble practices. Railroads were the heart of American economic growth, and they fed the expansion of a large and growing steel industry. The telegraph also required huge tonnages of copper for the wires across the nation as rail ties expanded from East to West. Most of the great railroad lines were built not with Morgan money but with public taxes and gifts of public lands. J.P. Morgan then captured these railways and thereby achieved vital control over the entire United States economy. By 1901 the Morgan Group controlled the Southern Railway, Mobile & Ohio Railroad, Queen & Crescent, Georgia Central, Georgia Southern & Florida, Macon & Birmingham, Philadelphia & Reading, the Erie, the Central of New Jersey, and the Atlantic Coast Line -- a total of more than 55,000 miles of steel rail track that controlled railroad rights of way, access to coal lands, terminals, competing lines and steamship connections. The emerging caste of American oligarchs draped themselves in the rhetoric of American ‘democracy.’ They carefully fostered the myth of ‘rugged individualism’ and ‘free enterprise’ to justify their huge gains and cover their fraudulent origins. By the end of the 1890’s Morgan and Rockefeller had become the giants of an increasingly powerful Money Trust controlling American industry and government policy. There was little room for the actual practice of democracy in their world. Power was the commodity of their trade. It was the creation of an American aristocracy of blood and money, every bit as elite and exclusive as the titled nobility of Britain, Germany or France – despite the Constitutional ban on titled nobility in America. It was an oligarchy, a plutocracy in every sense of the word—rule by the wealthiest in their self-interest. Some 60 families—names like Rockefeller, Morgan, Dodge, Mellon, Pratt, Harkness, Whitney, Duke, Harriman, Carnegie, Vanderbilt, DuPont, Guggenheim, Astor, Lehman, Warburg, Taft, Huntington, Baruch and Rosenwald—formed a close network of plutocratic wealth that manipulated, bribed, and bullied its way to control the destiny of the United States. 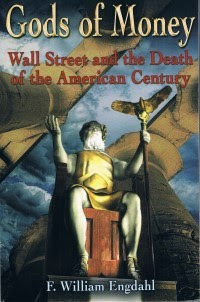 At the dawn of the 20th Century, some sixty ultra-rich families, through dynastic intermarriage and corporate, interconnected shareholdings, had gained control of American industry and banking institutions. One of the wealthiest of the new American oligarchs was Cornelius Vanderbilt who created his fortune through bribing state legislators to ignore laws prohibiting preferential freight rates to preferred customers. Vanderbilt at the time controlled all rail lines that connected to New York City. To promote and benefit from the greater profit margins of large enterprises, and squeeze out the smaller ones, Vanderbilt used a variety of tactics. Among his methods was to impose a 50% tax on small farmers to ship milk on Vanderbilt’s railroads. Farmers were not preferred customers; emerging large agribusiness groups who got Valderbilt’s preferred rates were. Vanderbilt later became an appendage of the J.P. Morgan circle. Another fortune of the day built on fraud and bribery was that of the Phelps and Dodge families and their Phelps Dodge Company, importers of metals such as tin, copper and lead needed to feed the American construction boom of the 1880s and beyond. Founded in 1834 by Anson Greene Phelps and William E. Dodge, the company went to great lengths to cultivate the image of being run by God-fearing Christian businessmen who donated their efforts to the Young Men’s Christian Association and other philanthropy. In reality, as an 1873 US Government trial determined, the Phelps Dodge fortune was built on a mountain of fraud, illegalities and bribery. A US District Court in New York fined the company $1 million --- a huge sum in those days -- for defrauding US customs by under-valuing the copper that Phelps Dodge imported from Peru and Chile. The company had bribed US Customs officials to facilitate the deal, depriving the US Government of significant import tax revenue. The list of American fortunes built on such fraud, corruption and bribery of government officials was long. It included the most famous names in America, men who donated money to the nation’s museums, endowed its finest universities like Princeton, Yale, Harvard with professorships, or had buildings and sometimes entire universities named after them. In this way, they created the image of philanthropy and “good works” while the reality was quite different. This small, elite group included railroad magnate, Edward H. Harriman, father of Averell Harriman, US diplomat, spy and confidential adviser to Franklin D. Roosevelt. E.H. Harriman used illegal means to gain control of the Union Pacific trans-continental railway, along with his Southern Pacific Company. By watering down stock shares and using bookkeeping tricks that would make Enron’s auditors envious, Harriman built an empire that controlled no fewer than seventeen major US railways. A 1907 US Government report stated that Harriman’s aim in acquiring so many rail lines was “to eliminate competition between them in transcontinental business.” The monopolistic restraint of competition violated both Federal and state laws. Such abuses became the focus of newspaper investigations and public outrage towards the end of the 19th century, culminating in the Sherman Anti-Trust Act passed by Congress in 1890. The law appeared to be aimed at reining in the practices associated with the Standard Oil Trust, the US Steel Trust of Morgan, the Sugar Trust, and the like. The trusts had been formed as a way for large corporations to protect their profits by combining with their competitors to set prices and control production. The first trust had been Rockefeller’s Standard Oil, formed in 1882. Soon, similar combinations or trusts were formed in tobacco, beef, whiskey, steel, mining, sugar and other industries. On the surface, the Sherman Anti-Trust Act seemed to be aimed at corrupt monopolists like Morgan or Rockefeller or Harriman. The reality was just the opposite. As early as 1895, the Supreme Court diluted the effect of the Sherman Act by ruling in United States v. E.C. Knight that manufacturing was not considered “interstate commerce” even though the manufactured goods were shipped all over the United States. This decision effectively put key industries beyond the reach of government regulation. A wave of mergers at the end of the 19th century engulfed most of US manufacturing, resulting in a few hundred huge corporations dominating the landscape. The biggest trust was Northern Securities Corporation of New Jersey; it was the umbrella enclosing 112 corporations worth $22 billion in assets and it was controlled by J.P. Morgan and John D. Rockefeller. In an apparent assault on this particular trust, the US Supreme Court declared in its 1904 decision, Northern Securities Co. v. United States, that “all combinations in restraint of trade” were illegal. While it broke up one railroad trust, the ruling clearly benefitted others, particularly E. H. Harriman. The Sherman Anti-Trust Act never in the least hindered Harriman or the other corporate giants. The law was a political charade to defuse public anger. The influential Harriman and his friends remained exempt from anti-trust prosecution while numerous small business owners were sent to prison under the act. The climate fostered by Morgan and his oligarchic cronies against any attempt by their workers to organize for better working conditions or wages or even unions was repressive in the extreme. The US Supreme Court was a bastion of oligarchic conservatism. In 1905, in Lochner v. New York, the Court ruled that states were not allowed to restrict working hours in private businesses, and three years later in the 1908 Danbury Hatters’ case, it ruled unions were forbidden to boycott to obtain better wages and working conditions. In 1902, indicative of the prevailing climate, George Baer, the man J.P. Morgan installed as head of his Philadelphia and Reading Railway, was named by the Pennsylvania coal operators to lead negotiations with striking coal miners. Anthracite coal was transported to numerous cities via the Philadelphia & Reading. In the decades before the dominance of petroleum, coal was the essential energy source used for home heating, cooking, powering factories and generating electric power. The mine workers were demanding an eight hour day, a ten percent pay increase and recognition of the United Mine Workers union as their future bargaining agent with management. They resorted to the only weapon they had—withholding their labor to press for relief. Baer, like Morgan, Rockefeller, Carnegie and most of their peers at the time, was a convinced social Darwinist who believed God had ‘chosen’ them, as they had manifestly proved ‘superior’ to their workers by virtue of their control of their businesses and their accumulated wealth. Baer told President Teddy Roosevelt, who had been called in to negotiate a solution, that there was “nothing to negotiate.” Only when Baer’s stubbornness threatened a national backlash in favor of the striking miners did Morgan intervene together with the politically shrewd Roosevelt to force a settlement with labor, one that gave concessions on hours and pay, but refused union recognition. The “Square Deal” established the principle of Presidential intervention in certain strikes and it made for good press, while Roosevelt, the “Rough Rider,” continued his backroom deals with J.P. Morgan and company. TR, as he was popularly known, was the self-proclaimed “hero” of the Battle of San Juan Hill in the Spanish American War of 1898, a nakedly imperialist venture that had made Roosevelt a popular political candidate. That tactical shift towards at least some of the demands of the miners won for the Republican Roosevelt major blue-collar support from ordinary working Americans whose vote was becoming increasingly significant. But Teddy Roosevelt had in no way changed his allegiance to the powers of great wealth. He was merely a shrewd politician who sensed which way the winds of change in the country were blowing and masterfully exploited it to retain Republican control of the Executive. This period would be misleadingly labeled the beginning of the “progressive era” in American politics. In reality the oligarchic families controlling the nation’s wealth were beginning to become more sophisticated about how they projected their image. None was more shrewd in that endeavor than J.P. Morgan. No American business giant of that day could hold a candle to the greatest fraudster and swindler in American financial history at that time—Junius Pierpont Morgan.